This is a nutritious breakfast that is similar to porridge or cereal. It is a favorite Egyptian meal for kids as well as adults. This is comfort food for me at any time during the day when my sweet tooth is calling. Store the cooked wheat berries, undrained, in the fridge. Whenever you need to serve, just heat the amount you desire and add the hot milk to it. Bring 2 cups water to a boil in a saucepan. Let soak, 6 hours to overnight. Drain. 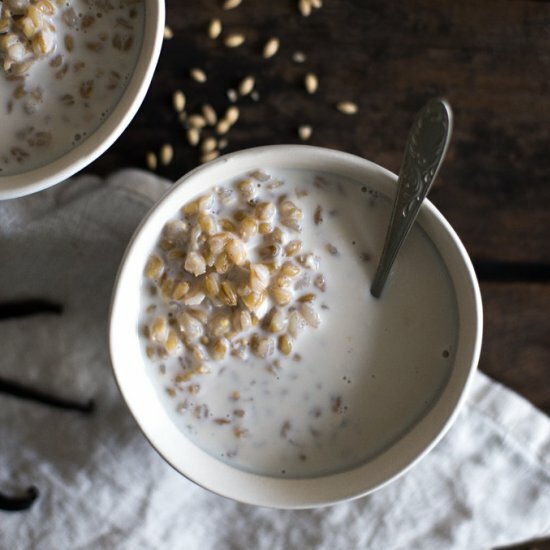 Combine soaked wheat berries with remaining 4 cups water; bring to a boil. Simmer over medium heat for 10 to 15 minutes. Remove from heat; let stand until berries pop open, 10 to 15 minutes more. Divide wheat berries among serving bowls.